Timed well with the Blu-Ray release of the Peter Jackson version of ‘Lord of the Rings’ is the first screen incarnation of the story, the Ralph Bakshi animated version. It runs 132mins, which is less running time than any one of Jackson’s Rings movies, and sure it ends on an unsolved cliffhanger, and sure it condenses much of the dense text of Tolkien, but for non-Tolkien devotees for such as I, it makes for a surprisingly well told ‘abridged’ (though aesthetically-dated) version of the story. Bakshi's version represents 'Fellowship of the Ring' and 'The Two Towers' books, with the misfortune of having an unsolved cliff-hanger ending. The film was not a success and thus, the sequel and final chapter of the story was never completed. 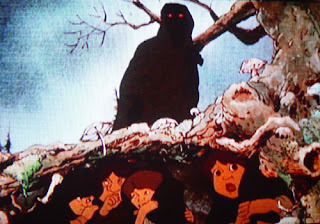 Ralph Bakshi's unmistakable animation style, for the most part, creates a unique mood and tone for the story. And looking back at the time period when serious sci-fi and fantasy were non-existent, Bakshi’s (time-constrained) reverence to the material and his commitment to telling an adult fantasy picture is a remarkable achievement and decades ahead of his time. To create a sense of serious realism Bakshi used rotoscoping techniques to animate his characters. Rotoscoping is a rarely used cinematic art form which involves hand drawing over top of live action footage, frame by frame. The result is a fluidity in motion difficult to achieve through traditional handdrawn cell animation. Of course, this meant that Bakshi had to film the entire movie with real actors, sets, locations, props, horses etc before animating the film. Again, a remarkable achievement. Bakshi’s film is actually enhanced by the presence of Peter Jackson’s film. For those who haven't read the novels, we get to use Jackson’s near full text adaptation as a reference point to Bakshi’s abridged version. And so as the film clips along with a sharp pace, plot wise, we realize how little Bakshi’s version differs from Jackson’s. Credit to writers Chris Conkling and Peter Beadle who manage to squeeze in all the major set pieces of the books, and getting in and out of each scene at the right time to conserve precious running time, arguably at the expense of the ‘breathing room’ and internal reflection of the characters. The film opens with the same voiceovered preamble to the rings forged for Men, Elves, Dwarves and of course, the one ring to rule them all. Then there’s the introduction to the Shire, Bilbo, Gandalf and Frodo. The one major difference involves the timeline of Frodo’s possession of the ring. In Bakshi’s version Bilbo gives Frodo the ring, which he holds for 17 years before Gandalf returns to send him on his way to Rivendale. Jackson’s condensing of Tolkien’s timeline creates a greater sense of urgency and instinctual action which benefits these scenes better. Once on his way the events which befall Frodo are scene for scene exact to Jackson’s version, save for the elimination of the Arwen character who brings Frodo to Rivendale. The midpoint of the film is the Rivendale sequence and thus, the second half condenses the second half of 'Fellowship of the Ring' AND 'The Two Towers' into just over an hour of screen time. Bakshi even manages to trump the emotional gravitas of Boromir’s death. While Jackson’s overloaded this scene with exaggerated music and melodrama, Bakshi’s is arguably the more elegant and genuine of the two. While there’s innovation in Bakshi’s style of animation, it’s also inconsistent aesthetically, and for lack of a better word dated. The characters are a mix of comic strip simplicity and the rotoscoped realism. Legolas for instance looks like he's pulled from TV Fun House, or an episode of He-Man, while the Aragon is drawn like the brooding hero he should be. What we miss most from Bakshi’s style is the details of landscape and the environment which seem glossed over likely for budgetary purposes. As such the characters often seem to be moving through matted backdrops instead of a fully realized alternate world. Regardless of your opinion of this version, Bakshi’s cultural importance in cinematic animation is never questioned. The Blu-Ray contains a decent half hour documentary looking back at Bakshi’s bold career which up to him creating ‘Lord of the Rings’ – a rebellious career which bucked all traditions of the genre. I really disagreed with you on the Boromir death scene. In the animated version, Boromir barely registers as a character so his death seems relatively unimportant (unless you understand the scope of the rest if the series). I loved some of the animation techniques though. I agree with the reviewer on the death of Boromir scene in LOTR 1978. I also agree that the later version was overly melodramatic as well as lame. I do agree with the previous poster that, because I was a fan of the books, the scene meant more to me. As far as the character himself, to be honest, Boromir is given short shrift in the books as well. Which is why I like the death scene, as it gives him a chance to redeem himself. And go out fighting, which is not a bad way too go! I enjoyed the movie, though for non-fans, it could be confusing. At least that's what I was told at the time. It's just a shame the movie was never completed with a part 2.